Acupuncture is the use of very fine sterile needles inserted at specific points of the body so as to rebalance the internal environment, re-establish homeostasis, and thus treat disease. 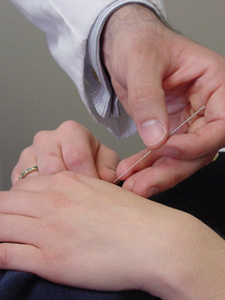 According to traditional theories acupuncture influences the vital force, or Qi, of the body. Western science has proven that acupuncture can regulate the body by many mechanisms, including stimulating the endocrine and nervous systems. Chinese herbal medicine is a complex science with a history of several thousand years. Unlike western herbs, Chinese herbs are usually given in combinations know as formulas, which are individually designed for your specific needs. Just as no two patients are alike, no two formulas are identical. Chinese medicine is a complete approach to your health and wellbeing. A major part of health is how we take care of ourselves, such as with diet and lifestyle. Qigong and Taiji (T'ai Chi) are exercises that combines movement, breathing, and visualization and is designed to create internal balance.